Leonie Industries would like to extend congratulations to Dr. Nkosazana Dlamini-Zuma, who was recently elected as The African Union Commission’s first ever female chairperson. The African Union (AU) is an intergovernmental organization with a mission to drive African integration and development; encourage international cooperation; and promote peace, security and human rights across the continent.The administrative branch of the AU is the African Union Commission, which implements AU policies and coordinates the organization's meetings and other activities. On 15 July at a summit of African leaders in Addis Ababa, Dr. Nkosazana Dlamini-Zuma was elected for a four-year term. 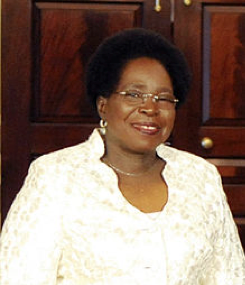 Having defeated the incumbent, Jean Ping of Gabon, she is also the first South African to hold the post. Who is Dr. Nkosazana Dlamini-Zuma? She was born on January 27, 1949 in KwaZulu-Natal, South Africa. Aside from being an experienced diplomat and politician, Dlamini-Zuma is a medical doctor. She was health minister when Nelson Mandela served as president and Dlamini-Zuma was married to current South African President Jacob Zuma from 1982 to 1998. Currently the South African Home Affairs Minister, Dlamini-Zuma is a member of the African National Congress Executive Committee and African National Congress Women's League National Executive Committee. A statement released by the ANC Women's League said they were "beaming with pride" over the election of one of their own and expressed great confidence in her abilities to take the organization and the continent forward. Dlamini-Zuma is tasked with making an organization that operates with a fairly small budget on issues of huge complexity, scope and importance, more efficient and more effective. The AU has faced criticism in the past for the pace of its decision-making process and the time it takes for action to be taken, such as in Libya last year. Moreover, Dlamini-Zuma has significant challenges to face in many parts of Africa: Somalia, Sudan and South Sudan, in the Democratic Republic of Congo, and in post-Arab Spring North Africa - to name but a few. At last week’s summit, the AU approved a budget of $280 million to fund next year’s operations and it is being reported that 96% of this will be financed by the institution's global partners. The US is the majority contributor, dedicating over $100 million towards development programs alone. The US also supports the African Union through its Unified Combatant Command dedicated to the African continent: U.S. Africa Command (USAFRICOM). USAFRICOM supports the delivery and sustainment of security cooperation programs and helps African countries with their own capacity building as they work towards long-term stability and security as a the basis for political and economic growth. For example, last month the AU and USAFRICOM participated in the annual ‘Exercise Africa Endeavor’, the continent's largest joint communications exercise focusing on the interoperability of equipment and information-sharing between African states. Leonie Industries congratulates Dr. Nkosazana Dlamini-Zuma on her prestigious appointment, and wishes her great success with the important tasks that lie ahead.